There's one of those giant junkyard/house supply places in Missoula, MT called The Axmen. You know, one of those huge run-down businesses where you can buy everything from a wood stove to as much irrigation pipe as you could ever want. Or, maybe you need a gun? 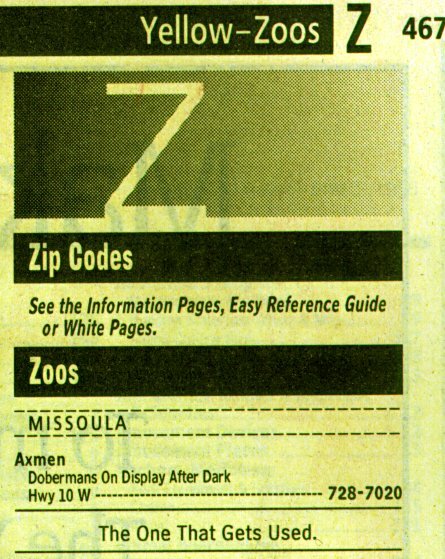 I happen to have a 1996 Missoula phone book, and I was thumbing through it one day when I decided to see what the last entry was. Just for fun, that's the kind of exciting life I lead. Now that is damn funny. A well turned phrase, too.